The Most Extraordinary Adhesive and Filler System EVER MADE! A revolution in adhesive technology. Insta-Fix Pro Adhesive bonds virtually any type of material in seconds; plastic, porcelain, tile, rubber, cast iron, wood, copper, vinyl, steel, glass, even leather. Not only that, it bonds these different materials to each other! Insta-Fix Pro repairs are done immediately. No time waiting for the repair to dry. The job is finished in seconds. What makes Insta-Fix Pro a phenomenon is NOXYBOND technology. That means no oxygen. 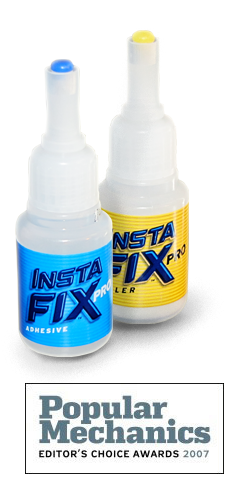 When the oxygen is removed by pressing the two pieces together, Insta-Fix Pro creates an incredibly strong bond – instantly. Only a drop or two of Insta-Fix Pro Adhesive is required (there is a lot of repairing in that little bottle). Use only a drop or two, then press the pieces together to eliminate the oxygen, and it’s done. Instantly. No curing. No waiting. On with the next job. Insta-Fix Pro: professional strength, professional size. Twice the amount of the consumer version. Repairs plumbing leaks in copper, metal, flex and plastic. Joins copper to plastic to metal to flex – any combination. Repairs pool liners and cracks or holes in pumps and pipes. Repairs rubber O-rings, power belts, hoses, and gas lines. Repairs broken tile and porcelain. Repairs surface cracks in almost everything. Perfectly clear for repairing glass. Repairs brackets, mirrors, bathroom and kitchen fixtures. Ideal as a nut-locking adhesive. Works great with gasoline leaks. Insta-Fix system is great for industries in the professional market such as After Market Auto, Plumbing & H-Vac, Marine, Building maintenance, Power sports, Carpentry, Pool & Spa and many more. It is an excellent product and we use it daily saving time and money. The product is easy to use, sets instantly, allowing us to sand, prime and paint immediately.